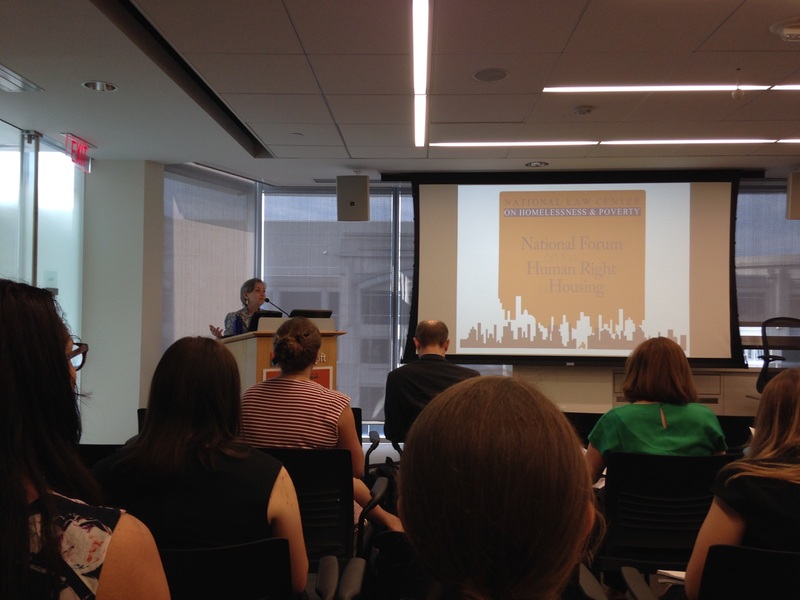 Wednesday, June 24 and Thursday, June 25 marked the Law Center’s two-day National Forum on the Human Right to Housing, hosted by the Microsoft Innovation & Policy Center in Washington, D.C. The event gathered organizers, attorneys and legal service providers, funders, federal agencies, and advocates at the local, state, and national levels to strategize coordinated approaches to opposing the criminalization of homelessness and work towards a common goal of a justiciable human right to housing. Keynote speaker, Mark Uhry of Fondation Abbe Pierre, spoke to the successes and ongoing work in his home country, as France implements a right to housing. Mr. Uhry provided a look at where we can go from here as many advocates seek to move towards this right in the United States. Following the keynote were presentations on current challenges and opportunities: advocates spoke on their current fight against the criminalization of homeless individuals, future goals shaping affirmative rights, and using the power of federal funding and framing to protect rights and advance housing. The Law Center facilitated discussion and advocated that the battle against the criminalization of those experiencing homelessness provided a unique and strategic opportunity to make a civil and human rights demand: safe and affordable housing for all. Morning breakout sessions spoke to litigation strategy, the power of organizing, and policy advocacy. During the lunch session, the floor opened up to a funder’s discussion led by P.J. D’Amico of the Buck Foundation in Denver, CO. He spoke about honestly about how advocates can partner with funders and encouraged those asking for funding to think of funders as allies. It was an honor to have his perspective and to hear about his passion of ending and preventing homelessness. In the afternoon, the issues were approached from the local, state, and national levels, discussing topics including local ordinances, Homeless Bill of Rights, affordable housing policy, and a shift from criminalization to pro-housing policy at the federal level. Thank you to Microsoft Innovation & Policy Center and our other sponsors, Covington & Burling LLP, Fish & Richardson P.C. and Sidley Austin LLP, and to our participants from all across the United States. Your time, energy and dedication were invaluable in facilitating meaningful conversation and moving us all toward consensus about our shared approach to ending the criminalization of homelessness and promoting instead the human right to housing. This entry was posted in Children & Youth, Civil Rights, Criminalization, Domestic Violence, Housing, Human Rights, Race, Veterans and tagged homelessness, Housing, Human Rights. Bookmark the permalink.